Avian Trio contains Bee Pollen, Royal Jelly and Bee Propolis providing your bird all natural bioflavonoids, amino acids, pantothenic acid, natural hormones, the beneficial fatty acid – HDA, enzymes, B vitamins and chelated minerals. In the wild, thousands of species of birds eat flower pollen as part of their diets. 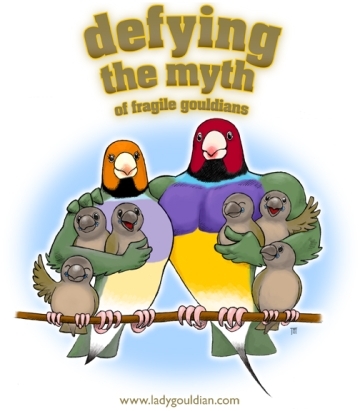 The basic problem of all bird owners is, simply, how do you duplicate a natural diet for a captive bird? Most bird owners realize that commercial bird foods process their ingredients, sacrificing nutritional integrity for shelf life. That’s why a lot of responsible bird owners feed their birds raw fruits and vegetables. Unfortunately, even selected raw fruits and vegetables often do not provide a complete nutritional profile. Avian Trio is a concentrated source of nutrients…raw, unprocessed and full of vitality! Bee Pollen is one of nature¹s unique and most powerful foods. It is flower pollen that bees collect for food. Bee Pollen offers a treasure trove of special plant nutrients. The nutrients found in Bee Pollen are extremely high quality that can be burned as fuel and it also provides nutrients that are helpful in maintaining and promoting health. The nutritional makeup of Bee Pollen is extremely broad spectrum. The wide range of nutrients found in Bee Pollen include polyphenols, enzymes, beneficial fatty acids, free amino acids, vitamin complexes, chelated minerals and trace elements, as well as a large array of phytonutrients that have yet to be identified. This nutritional diversity makes Bee Pollen an ideal dietary supplement as a complement and boost to a well-rounded diet. The nutrients in Bee Pollen are very concentrated. This nutritional density means that even small amounts provide effective and valuable levels of important nutrients. In other words, bee pollen, as a food source or as a supplement, provides low volume, but high intensity, nutrition. Because of the broad spectrum of nutrients that bee pollen offers, it can be an excellent addition to your bird’s diet. Bee Pollen can make it easy to fill in the gaps in a nutritional profile especially when your bird is a picky eater. That is one reason why Bee Pollen is such a valuable supplement to the diet, because it supplies many of the dietary antioxidants, bioflavonoids and polyphenols that our birds are missing when they are eating only a dry seed diet. Royal Jelly is a special substance of the beehive. Royal Jelly is solely responsible for the incredible transformation of a queen bee from an ordinary worker bee. Royal Jelly is so complex that it has not yet been possible to fully analyze it. Of course, it is impossible to synthesize it in a lab! We do know that it contains the following: natural hormones, all of the B-complex vitamins and it is rich in pantothenic acid. It also contains nucleic acids, essential amino acids, essential fatty acids (especially Omega 3's), acetyl choline, lecithin, collagen and gamma globulin - a key component of the immune system. However Royal Jelly is a fragile product, so it is necessary to always keep Avian Trio refrigerated after you receive it, the same way we do after we receive it from the manufacturer. The name, Defender Of The Hive, is a very appropriate term to describe the role of Propolis in the beehive. Bees use Propolis to virtually encase the inside of the hive. It is used to caulk and seal every crack, and a very thin coat of Propolis is spread over the surfaces of the honeycomb cells, inside and out. This is important for the prevention of infection in the honeycomb. Propolis is used to sterilize the honeycomb cells that contain the larvae, as well as the cells that store the honey and bee pollen. Propolis is also used extensively at the entrance of the hive to form an elaborate, winding tunnel. Bees literally have to crawl through a tight tunnel of Propolis to enter and leave the hive. In this way, bees are cleansed of microbes as they enter the hive, and the sterility of the beehive is maintained. In fact, the beehive is the most sterile environment found in nature. The fact that this structure, located in the wild, and full of food and organisms, can be kept free of disease and infection is quite remarkable. In very real terms, Propolis functions as the natural defense and immune system of the beehive. Propolis contains many of the same polyphenols found in bee pollen, but in much higher quantities. Modern researchers have shown that certain tree resins, from which bees make the Propolis, can kill bacteria, thereby protecting organic compounds from degradation. Tree resins typically have high concentrations of polyphenols. Many polyphenols have been shown to be anti microbial against bacteria, fungi and viruses. These actions are essential to the immune defense of the tree. Polyphenols have also been shown to play important roles in the trees biochemical response to stress, disease and physical damage. Propolis has an astonishingly high polyphenol content. No other natural substance comes close. In terms of dietary supplements, no laboratory could do better than nature’s design of Propolis. Start slowly. Begin by adding a small pinch to your bird’s diet each day to get them accustomed to the new taste. 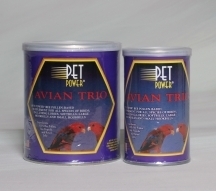 Avian Trio can be fed free choice, mixed with baby formula, or sprinkled on fruits and vegetables. Gradually increase the amount over the next 2 weeks until the dosage level reaches ¼ teaspoon daily for small to medium size birds and ½ teaspoon daily for large birds. Avian Trio is very beneficial when added to baby bird formula because it adds a complete spectrum of quality nutrients to start your birds off right.